Managing costs effectively can only take your business so far. What your bank really needs is accelerated growth. Whether it’s entering new markets, introducing innovative new products, or initiating transformational process changes, you need to aggressively unlock the key value levers of your business. Very powerful waves of change are creating new opportunities. The advent of the digital consumer, new commerce changing the rules of the game, and the emergence of the Cloud are some significant examples. We believe that accelerating innovation will enable banks like yours, to withstand further tremors, counter market forces, spark growth and create competitive advantage. However, one must be careful to invest energies in meaningful innovation, which contributes to agility, efficiency, growth, and value creation for both the organization, customers and partners. Product, service or process innovation initiatives must be aligned with the new reality defined by higher customer expectations, tighter resources, fiercer competition and stricter regulation. Although banks innovate from time to time, most do not have a cohesive innovation strategy in place. That needs to change, and quickly. While laying down the vision for innovation, senior management must ensure ground-level support by way of technology infrastructure, employee training and a collaborative partner network. This is the proven path to accelerate innovation and build tomorrow’s bank. Finacle™ from Infosys helps banks stay ahead of changing customer demands, emerging competition and mounting global regulations, by partnering in product, service and process innovation. Product innovation results in simpler products. Undercurrent opinion has it that “too much innovation” lead to creation of complex, risk-laden products that consequently pave way for financial crisis. But product innovation helps banks to comply with regulations and assure both regulators and consumers about the security of their offerings. Product-specificity is no longer adequate as customer expectations are always in a state of flux – they expect products that are tailored from their point-of-view. Hence, product innovation must be played by the new rules, which state that they must be prepared for change. We believe that product innovation follows a “power cycle” that enables banks with varying market power to achieve different goals. Banks must adopt product innovation to drive growth, achieve leadership and extend dominance. Consequently, individual innovation strategies must target different priorities such as creating relevant, value-added, extensible products, incorporating greater transparency, and customer feedback within the offerings or making products more inclusive and replicable. Needless to say, the success of these initiatives depends on the agility and efficiency with which they can be implemented. Process innovation has been a transformational force for years, and continues to hold sway over banking. 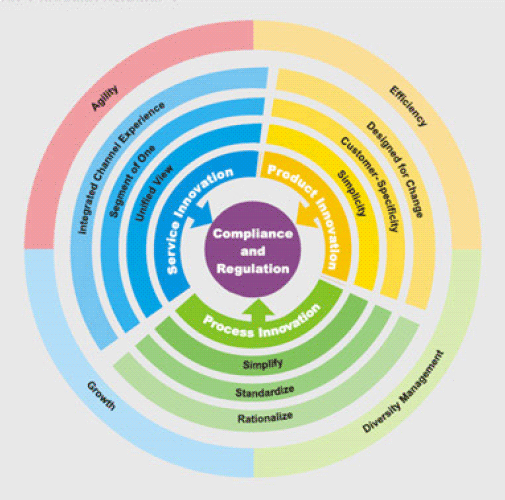 Processes are banks’ proprietary advantage and their biggest drivers of differentiation. The traditional model of process innovation focused on simplification, standardization and rationalization; the new one has made a subtle shift towards maximizing value for customers. self and personalized service as per need; time-advantage guaranteeing service fulfillment anytime, anywhere; and transparency-advantage bringing predictability and credibility to the relationship. In tomorrow’s market, service, and not sales pitch, will drive revenue growth. Banks must leverage their 360 degree view of each customer to create a “Segment-of-one marketing” and propose customized service offerings. In line with the preference of present-generation customers, existing services must be rendered in self-service mode. Banks must remember that as they take this new approach to service innovation, in the future, customer care, and not complaint resolution, will drive customer retention. Clearly, the rules are changing, and so must the way of playing the game. At Finacle ™, we believe that banks need a creative and adaptable game-plan to enter tomorrow from a position of strength. Financial institutions must be willing to visit basics and rewrite the script where customer service is concerned. It is time for banks to bring new ideas and creativity to the table.